Category Archives: What the ?!?! So after that bit of satisfaction of smashing something…I slowly started to realize that I just got the phone maybe 2 months ago (I swapped my brand new Samsung S7 for it) and I hadn’t done a back up yet and over the course of 2 months I met a lot of people at the exhibitions and events, not to mention the pics I used my phone for….So I’m stewing about to boil over so I exiled myself to a corner and I’m fighting off the flu. The high prices are from Samsung. Note: If you let Samsung fix your phone they WILL wipe your phone! They said because they reflash the phone or something like that. Also, they won’t back up for you! Where as the shops, they only replace the display so your data will stay intact. The worry now is the warp on the phone has it caused any issues with the motherboard, Samsung said maybe, other shops say probably not. All say have to replace the display first. Time it takes to change the display is 2 hours, Samsung 2-3 days. The shops that don’t have the display in stock will take a week to get it in. I went with a shop in Far East Plaza called CityMobi. A gentleman named James helped me out. After much deliberation I went with CityMobi because no one had a blue display (my Note 5 is the blue one) but he offered gold or white. No one else offered. But most of all, in my opinion, he was the most honest, realistic person that I had spoken to. He was pretty sure the bend was not serious and the motherboard should be fine. So I chose the gold display went back 1h 45 min later and it was done. The phone works, my data is all there and dang, I think two tone looks pretty good. The phone is still a bit warped, the speaker grill thing at the top is a bit wonky but hey….it works! Anyways, i was offered a discount on a gold colored case (I guess my two tone phone isn’t as cool as I thought?) and screen protector so what the heck I got both. All in, it cost me $325, an expensive lesson to learn what button sets me off. I hope none o’ya have to go through this but if ya do, I hope the numbers and process helps calm you down. Oh, if you haven’t done so already, BACK UP YOUR DATA! So my feet has gotten waaaay better now. For the whole story, here’s where it started. The full story is at the end, under “UPDATE 2). My neighbors upstairs are renovating. From the sounds of it they are tearing down a wall or three. That’s good for them and I’m happy for them until my ceiling starts to break / crumble / fall down not even sure how to describe it. Check out the pics.. So I went up to talk to the contractor, they told me to contact the HDB (Gov’t entity that built the building) because this kind of damage is normal for older buildings and they will decide who has to pay. So I did and they told me, I have to pay there is a “scheme” called a GRA (Goodwill Repair Assistance) which covers 50% of the repair costs AND the max the owner must pay tops out at $300. Sounds good, except I shouldn’t have to pay in the first place, I think my neighbor should cover “my” 50% because my ceiling wouldn’t have come down if the didn’t start jack hammering their walls/floors. Anyways, the inspector guy who came to see the damage said the gov’t contractor who is going to do the repairs is back logged and it may take months for them to get around to my unit. LUCKILY, I got an appointment for next week. The repair works is called “spalling” which means they just mix some concrete and put patch up the hole. They’re supposed to paint over the rusted rebar to prevent further rusting but most of the rebar is gone now anyways, so we’ll see what they do. The worst part is I had to remove a kitchen wall cabinet to reveal the full extent of the ceiling damage and I found out the crown molding was only resting on top of the cabinet and held to the ceiling via sealant. WTH?!?!?! Yeah, so it fell off as soon as the cabinet was lowered. Gotta love them corner cutters…lol. First world problems…sigh. 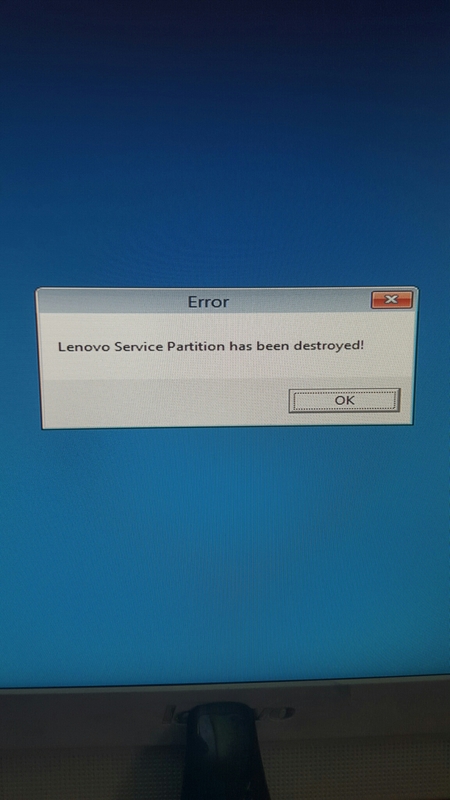 Lenovo service partition destroyed. Got this after the windows 10 upgrade. Everything still works tho but I just have wasted (used) space now. Can’t figure out how to reclaim that space without wiping drive (I don’t have win 10 cd’s), oh well.